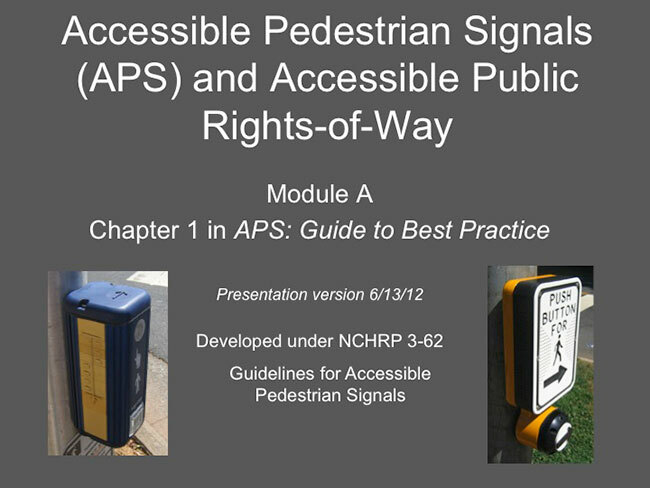 In this module, we’ll provide an overview of new types of accessible pedestrian signals and regulations related to public rights-of-way. The modules correlate to various chapters in the APS Guide; this module covers some of the material in Chapter 1. The chapter provides more information and detail on these issues. Also, we’ll go into greater detail in later modules about some of the issues we cover briefly here and in the first chapter of the guide.